The staff and pupils of St. James's Paisley hosted a visit this week from a Senior Delegation from the United States of America. 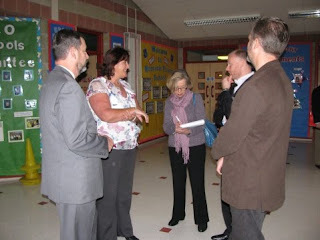 During their week-long visit the CoSN group chose certain schools to visit in Scotland and the Netherlands. They were looking to see innovation and new ways of learning which are helping to transform the education of our young people. They interviewed pupils and staff and were guided through the new way we organise our curriculum and how we have ICT embedded in everday teaching, across each stage of the school. Their reports about the visit can be read on the CoSN blog where our school is highlighted for the care we show to our pupils.